Here are some hot clutter-free tips that can make your home look more appealing and–an added benefit–easier for you to live in, too. The kitchen is an area that tends to get cluttered easily. Even if the countertops are cleared off, inside the cabinets often lies a cluttered mess. Those crammed cabinets are not appealing to buyers. They often see the disarray and think there’s less room for their own items than there really is because they can’t see behind the clutter. Star Hansen, a professional organizer, says cans create the most clutter. She recommends using soup can racks to store them. They’re inexpensive and they store three times as many cans. Spice racks are a great way to clear the clutter out and make it look clutter-free. Hansen also shows how to use storage solutions like airtight containers, hanging baskets, shelf dividers to separate food items, and how to use chalkboard and magnetic paint. Painting the inside of your cabinet with magnetic paint allows you to hang light-weight items like aprons, towels, or recipes inside your utility cabinets. Using chalkboard paint, you can write notes inside your cabinet about which supplies you need to purchase. Using airtight containers to store pastas, grains, and other food works well in the cabinet to conserve space because they’re stackable. Hansen also recommends using a label maker to mark all the food sections. Grouping food together in categories such as ingredients or prepared food and then placing those items in boxes allows you to easily grab what you need without having to move 15 items just to get to the one you need. The key to this type of clutter-free reorganization is to make sure it’s portable. Since you’re selling your home, you likely don’t want to spend the money installing professional systems that will remain with the home when you move. Fortunately, there are wonderful products on the market that help you organize without having to drill or glue them into your cabinets. These shelving products look good and, when all the items are placed inside the shelves or under-shelving hanging baskets, you’ve created the illusion of more cabinet space–a plus for all buyers. So where do you look for these products? 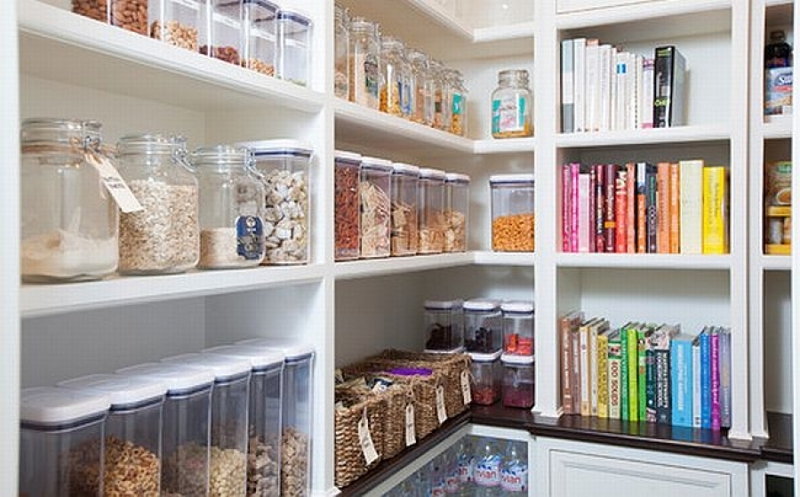 Without even leaving your home, companies like Rubbermaid, make it simple to view a wide selection as well as see some creative options for organizing your pantry. Many of the products are under $20 and well worth the price to reduce the headache of searching through a crammed pantry or over-stuffed cabinet. One of my favorites is the Corner Helper Shelf: it holds up to 10 pounds and allows you to stack food items below it. The best part of doing this type of reorganization is that when you move, the inside of the cabinets look great for buyers and you’ll be able easily pack up and take all this work with you to your new home.